This is the much sought after, out of print English edition of this book you need for identifying butterflies all over the continent of Europe. It is easy to use as a systematic key that Tristan has spent half a lifetime constructing and taking the many colour photos for. It is also light enough to carry in the field. 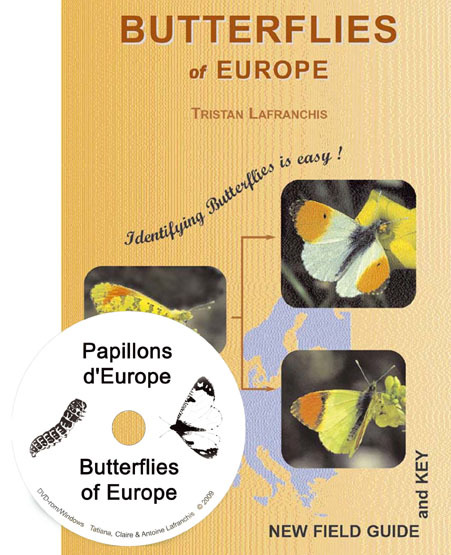 Butterflies of Europe, by Tristan Lafranchis in English - now available direct from us - just click on add-to-cart below! See www.bc-eig.org.uk website for more information about the European Butterflies Interest group. and about the new revised edition of this book in French and Polish. At last a field guide which allows the identification of all the butterflies flying in Europe with confidence. This pocket field guide (13 x 19 cm, 352 pages, 1300 colour photos, softcover) has everything to become the ideal companion of your travels and excursions. This book is basically a subdivided determination key. The beginner can follow it step by step untill he gets the name of the butterfly, the keen entomologist can directly go to the relevant genus or species. There are about 1300 colour photos of living butterflies with useful lines pointing to distinguishing features. For each species the text, photos and distribution map are presented together. The distribution maps are precised and updated, with detailed maps for local species. The author’s aim is to enable the identification of all species in the field without killing them, and there are genitalia drawings for the more difficult species with a method to check them without killing.
" This lovely book presents a quantum leap of an advance in field guides on butterfly identification (…). The photographs are simply excellent and the accompanying keys are clear and simple, the print large and easily read in the field. (…) Almost everything in this book is innovative (…) This book is manifestly something special for butterfly recording. The proof of its value will gradually emerge over the next decade or so." " I have no hesitation in recommending it as a first-class volume (…) It is also the fruit of a great deal of expertise, and I expect my copy to get a lot of use." " It really is an addition to the existing guides to the butterflies of Europe and one that goes much further than the others." " (…) excellent photographs (…) and a key to the diagnostic features of each butterfly make this book a must for anyone interested in identifying butterflies." " (…) book we now call 'the butterfly Bible' because it is THE BOOK to use! Very, very well used & liked." " All told if you are looking for a book to get you started on the butterflies of Europe this will do the job well, and if you are familiar with the common species already and looking to extend your expertise then this book will also serve your purposes well.